The Baltic Sea may be a small Ocean compared to the vast Atlantic or Pacific Oceans, but it´s an Ocean with some 415.000 square kilometres sheer endless opportunities for the sailing crew to experience a European culture at its best: The nine countries bordering the Baltic Sea form a unique conglomerate of places with a rich history dating back thousands of years. Celtics, Barbarians, Vikings and the Hanse did shape this area providing the interested sailor with a number of very interesting places to see. Of course, not speaking of the rich natural heritage. Rostock is an old city of the former mighty trading alliance, called the “Hanse”. For some 500 years this mere economical, later political and military alliance was ruling the Baltics and determining all of the European lines of trading and commerce, shaping the northern part of Europe and connecting it to the wider trade network of the southern European part, dominated by the Venetian trade alliance. 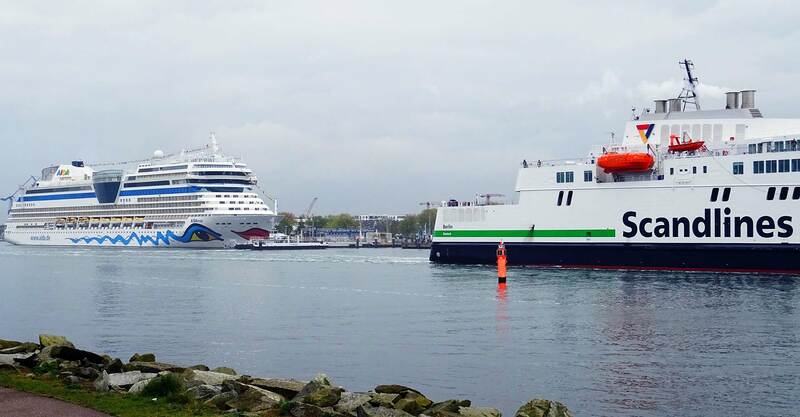 Today, Rostock is the German hub for tall cruise ships as its harbour is nearest to Germany´s capitol Berlin. Warnemuende belongs to Rostock and functions as its port. “Hohe Duene” means “High Dune” which is a reference to the estuary of river Warnow which is running all along from Rostock into the Baltic Sea. Upon nearing Rostock you will notice a long, fine white beach on your right hand side with high dunes – the marina is situated on your left hand side facing these dunes. Thus making it a name well chosen. 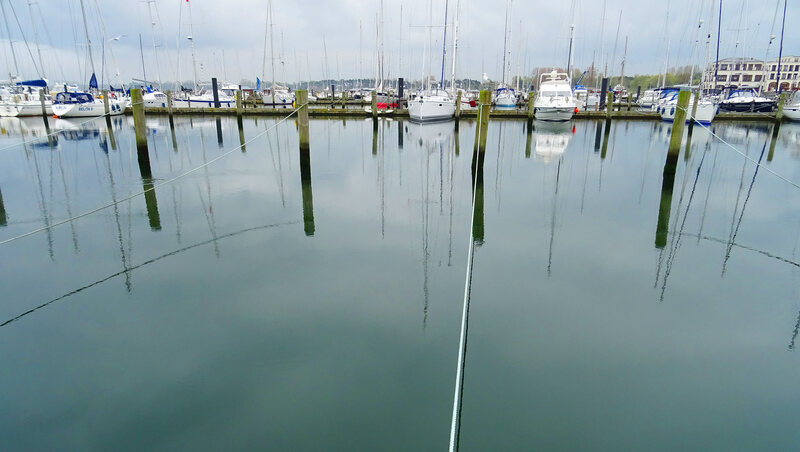 Marina Warnemuende is one of three possible places to land your boat for a visit to Rostock: There´s a smaller marina opposite of Hohe Duene and the Rostock harbour itself (it takes one additional hour to steam up the Warnow to reach it). Hohe Duene is a 5-Star-Premium marina. Architects and Engineers have not spared any efforts to create a unique experience for both sailors and guests from the shore. When I am in Warnemuende, I am always reminded of Venice when I take a look at the buildings: Everything is shiny new and white, three-story tall complexes of Hotels, fine Restaurants, Premium shops and sailing clubs. You reach Hohe Duene by simply following the commercial fairway into Rostock port. Before passing the two large port entrance lights you take a sharp turn to port side and enter the marina. There is simply and surely always a free berth available here due to the fact that this marina is a huge port: Some 920 berths for boats of all sizes are offered. Mooring is European standard berth with two piles and a jetty, some less berths are also available for large ships and multihulls with a length of up to 60 metres for landing alongside. There are seven long jetties and a very special jetty with a round shape in the center of the harbour – here you can have your boat moored right in front of the 5-star hotel facing some high priced restaurants. Electric current power supply and fresh water is available from standard connections and taps and easily reachable from every jetty. No matter where you land your boat. This is a cool thing: Because of the sheer size of the Hohe Duene-marina, the sailor can choose if he wants to be in the middle of the party or keep some distance in a more quiet area. When I came here, I chose the latter of course, because Hohe Duene is also a magnet for shore-visitors strolling the waterfront for shopping, looking and having an expensive cone filled with premium ice-cream. High priced is also demurrage here. I was paying not less than 25 Euros with a 36 feet sailing yacht, which is big money for such a small ship. And for just a one day-stay. It speaks volumes that you won´t find a berthing price-list on their website online. 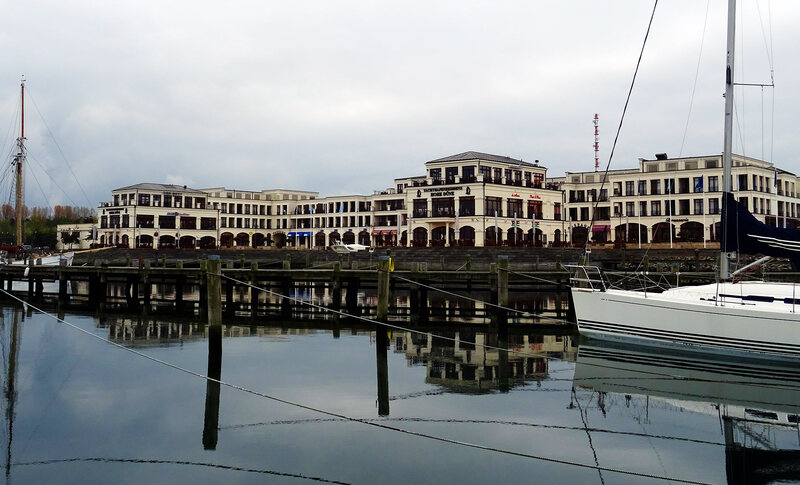 Nevertheless, the amenities and arrangements of Hohe Duene marina are of superior quality for sure: There is perfect WiFi-connection available at all berths, the yacht-shop is well equipped (if you seek clothing and accessories) and the small bakery will provide with fresh stuff for the perfect breakfast. Bathrooms. 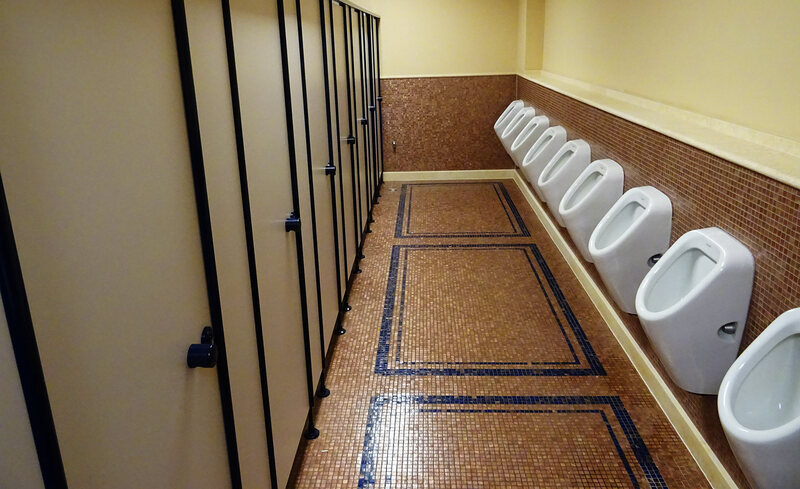 The old story of sailors longing for a quiet and clean place for showing and taking a dump. Well, Hohe Duene offers one of the best bathrooms I have ever seen in a marina. 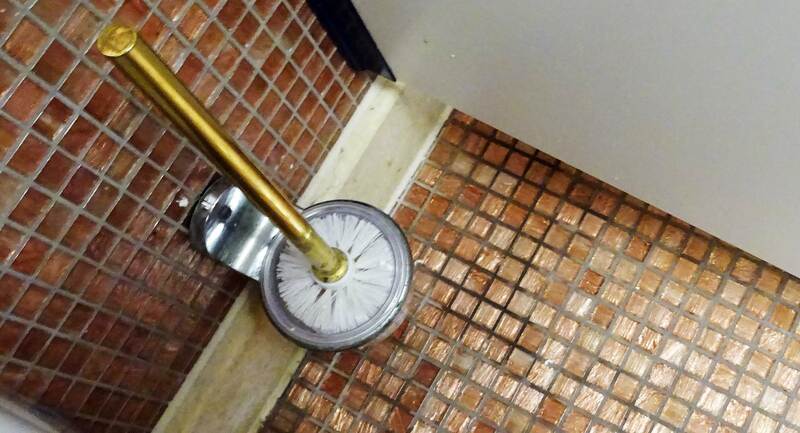 Moreso, the Toilet brushes are … golden here. Everything lives up to the 5-star-image of this marina and so do the bathrooms as well. Everything is shiny, well-kept and always clean. Except for one thing: There is only one bathroom-facility for the whole marina. So if you choose to land your yacht in a more remote berth to enjoy some quietness, it will take quite some time to walk down the jetty and all along the waterfront to reach the bathrooms. Once there, it´s a treat for sure. Hohe Duene offers no less than seven different Restaurants – all are high priced and of superior quality: From fresh fish to Italian specialties, from high-end Hamburgers to perfectly grilled T-bone-steaks, from waterfront-outside seating to third-story panoramic view over the marina, if you are willing to spend a dime or two you will definitely have a wide choice of different tastes to get tickled and a number of days to try out different dishes. This is a bit awkward, isn´t it? If you prefer more local and “unique” food, then you will walk down some couple of hundred metres along the shoreline of the Warnow-river to take the ferry to the other side in Warnemuende. Here – although it´s usually crowded with tourists, especially if one of the big cruise ships is in town – you will find plenty of more reasonably priced restaurants and snack bars. Why not try some fresh smoked Baltic fish sold directly from the cutter? Hohe Duene is definitely one of the most sophisticated, well-kept and well-run marinas I have ever had the pleasure to berth a boat in. Everything you´ll find here is of very high quality and well maintained. Staff is competent, friendly and always willing to help, no matter what. Surrounding, buildings and bathrooms are of evenly high quality and a stay here should definitely be on your things-to-visit-list when you are sailing around in the Baltic Sea. Due to the very high prices here, I suppose, this will be just a short – but unforgettable – stay.